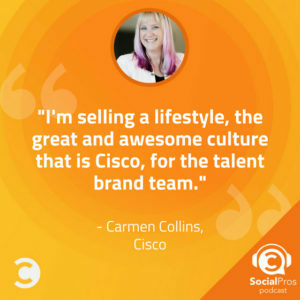 Carmen Collins, Sr. Social Media & Talent Brand Manager at Cisco, joins the Social Pros Podcast to discuss building a talent brand through social. Successful businesses—regardless of size, location, product, or any other defining factor—know to embrace marketing. Simply put, you have to tell your audience about yourself and your products so that they can become customers. Carmen Collins and her team at Cisco know that just as you would market your brand to your potential customers, you should also be marketing to your potential employees. 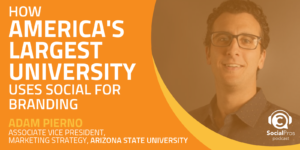 While your more consumer-focused content will help establish your brand values and personality, developing your talent brand will help you establish your values as a company for prospective employees. By engaging your employees to show what they love about working for you, you can establish a strong talent brand for potential candidates. Furthermore, at Cisco, Carmen has shown that establishing your talent brand can build excitement and camaraderie within your current team. How to develop “EGC,” employee generated content. Tips for marketing a talent brand through social. How to balance content geared towards consumers with talent brand content. How to incorporate interns into social strategy and testing. Why review sites are affecting talent acquisition. As a huge fan of The Walking Dead, Carmen would love to speak with Andrew Lincoln! She’s met many of the cast members but has not yet met him. She would also love to ask him why he’s leaving the show. Jay Baer: Hey, everybody. It's Jay Baer from Convince and Convert and this week on the Social Pros podcast, my man, my special Texas friend, he is the executive strategist from Salesforce Marketing club, Mr. Adam Brown is with me, and boy, this is like an enthusiasm overload this week, Adam. Adam Brown: It really is. We haven't had a whole lot of guests on the show twice. I think, Jay, you've consulted the database and the archival teams and I think it's less than five, right? Jay Baer: Maybe a little more than that, but it's definitely less than dozen for sure, and that's across all nine years of this show, so pretty rare for us to have somebody on the show twice. Adam Brown: It is, and Carmen Collins, senior social media and talent brand manager at Cisco. Really, as she did three years ago, has some great stories to tell about how brands like Cisco really find and recruit and retain talent and a lot of about what has changed in the past three years. We've got platforms like Snapchat that just three years ago were just burgeoning and you've got technologies and platforms like Glassdoor and others that weren't even around just a couple years ago. Jay Baer: Yeah, and she goes into some great detail on how the operationalize some of these things how they find [inaudible 00:01:12] from a very, very large employee pool, how they get employee-generated content activated, how they do their editorial calendar. This is an episode that's gonna have you taking a lot of notes, especially if you have anything to do with recruiting via social, and I think most of us should at some level. Really, as you mentioned on the show, it's part of the thinking of social as a layer in your company instead of a marketing department. Adam Brown: All of are recruiters in terms of what we do and we try to bring in new employees, but specifically as you said, how do we empower those employee's EGC as Carmen calls it, Employee-Generated Content, being such an integral part of all that? Jay Baer: I gotta tell you guys if you don't want to work for Cisco after you listen to this show, I will be very, very surprised because Carmen is about hilarious. She's tons of fun. She's passionate about what she does. This is one of my favorite conversations we've had in a long, long time this week on the Social Pros podcast. 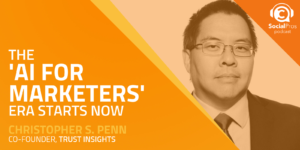 Hi, it's Jay Baer and this week's episode of the Social Pros podcast is brought to by Salesforce Marketing Cloud who have a complete guide for B2B social media marketers that you can download right now. It will show you the best types of content, the best time to post content, the best channels to use, what kind of metrics to use. It is super comprehensive and absolutely free. Go to bitly/socialb2bguide. That's bitly/socialb, the number two, bguide, all lowercase, to download it right now. It's from our friends at Salesforce Marketing Cloud. Also, the show this week is brought to you by our pals at TechSmith. Man, I use TechSmith tools all the time. Snagit and Camtasia, with tools like these, anybody can create custom screenshots, screen casts, videos. If you're trying to merchandise your results internally and show your boss how great you are at social, you can be using a lot more visuals than you're using today. If you need marketing videos, but you don't have a production team, Camtasia is for you. It's for folks who don't have video experience. Communicating with visuals is more important than ever. Camtasia and Snagit make it easy. Go to techsmith.com/socialpros. That's techsmith.com/socialpros to learn more. Thanks so much. 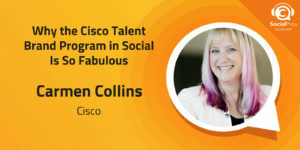 Carmen Collins, senior social media and talent brand manager at Cisco is back on Social Pros after an almost three year absence. Carmen, how are you? Thanks for being here. Carmen Collins: Don't tell my boss that. She'll freak out. Adam Brown: We are more important than HeadHunter, yes. Jay Baer: Yes, most people who are on this show are gone within a year. That is the truth, but not you, Carmen. Jay Baer: We are glad to have you. Carmen Collins: ... be working at Cisco, so thanks for having me back. Jay Baer: Cisco is the best, one of my favorite companies to work with, as well. Tell us, you do a little different style of social as people who maybe heard you three years ago remember, but let's recap that for folks. You are not selling stuff in social. You've got a different angle and a different approach and a different ... Tell us how it works. Carmen Collins: Well, I'm still selling something, but I'm selling something pretty awesome. I'm selling the idea. I'm selling a lifestyle. I'm selling the great and awesome culture that is Cisco and my KPIs for the talent brand team, and if you don't know what a talent brand is out there in podcast land, it is a way a company goes externally into the market to talk about the culture, what the people are like, what kind of jobs you'd be doing, what projects you'd be working on in order to attract talents to come work for you company, and as Cisco is one of the largest IT companies in the world and we're headquarters in Silicon Valley, as you can imagine, we have a lot of competition for that very highly sought after tech talent, and it's my team's job. We use the We Are Cisco social media handles. You can find us at We Are Cisco pretty much everywhere, even on Snapchat, and it's our job to go out in the world and talk about what a cool place Cisco to work. It's not a hard gig because Cisco is a really cool place to work. As you said, I'm still here three years later. It's awesome. Jay Baer: How do you tie social back to those recruiting success metrics? Is it total number of applications? Is it some sort of formula that says, "This candidate is of a higher quality"? Is it retention so you don't have people leaving Cisco? How do you say, all right, yeah, we're gonna put money, head count, Carmen into the field here to become an employer of choice? What does that spreadsheet look like? Carmen Collins: Well, I'm glad you asked that because last year, I was really tired of hearing people say that social doesn't matter when it comes to recruiting talent and I made it my mission to prove them wrong. I'm such a rebel that way, but we use the full funnel just like sales metrics, just like most social media people would do. We track awareness, so we are driving shared voice when you're talking about great places to work or the list of top 10 best companies to work for, or here's your Glassdoor top best reviewed companies, so we have those awareness metrics that we're tracking against, and then we have our engagement metrics or what we call consideration, people relating to us. If a tree falls in the forest and nobody Instagrams it, does it happen? Jay Baer: Yeah, that's great. Carmen Collins: It's not everything isn't one to one. It's not, oh, social for sure drove this metric because people don't come in and out of the funnel in a straight line. Carmen Collins: I'm really good. I'm really good. Jay Baer: I know you are, Carmen. That's why you're back on the show, but there's a level at which this is an assisted conversion as the kids would say. Jay Baer: It's funny you say that because a lot of people, they have third party ... A lot of companies that I've worked with even on talent brand social, they have third party application software and so even if you want to be able to track it back all the way, it just gets all messed up and they can't do it, so it's really great that you were able to have that visibility all the way through the funnel. That's awesome. Carmen Collins: Yes, and of course, yes, we do have a retention metric, the cost of retaining an employee is zero and that saves Cisco's bottom line some money and we're all about driving business impact with what we do, but because our entire strategy around talking about talent brand and social media is what we call EGC ... Most people call it UGC, user-generated content. We call ours employee-generated content. Jay Baer: That's what I call it, too. I love it. Carmen Collins: Do you really? Jay Baer: I don't know. I'm gonna have to check my copyright one that. Carmen Collins: Give me a little asterisk in your next [crosstalk 00:08:58]. Jay Baer: You got it. You got it. Carmen Collins: Carmen uses this, too, but because we've built it around advocacy, advocacy's a huge part and it does play retention ... There is a retention role in what we do. Employees get excited when they’re featured on [inaudible 00:09:12] Cisco and they get excited when we reach out to them by seeing a post on Twitter or Instagram and saying, "You really have a story and we'd like to share it." It amazes me. We have amazing employees. I kid you not. We have a Shark Tank alumni who got a deal on Shark Tank and we have an Amazing Race runner. We have a guy who works in blockchain. We have folks that work in artificial intelligence, things you don't think of Cisco as doing and that's part of my job is tell people, yes, we're really cool. We have this. Jay Baer: That's my question because having done, again, some of this work as a strategist for some of our clients, one of the challenges, and I really want to know how you handle this, one of the challenges is how do you find the stories and how do you surface them? It's a big company. It's a disparate workforce. You've got tons of different job sites. Some people who even are rad and have a cool story, A, don't think their story's that cool, B, are not really storytellers, because they're an engineer or whatever, so how do you do that? Are you sort of a reporter or do you rely on other employees to tell on each other in a good way? What's the raw materials for amplification? Carmen Collins: Well, the first is having a great team. I have an amazing team of people. We're small, but mighty, and we're all from a social media background, so when we knew we needed to find these advocates, we went to social and our employees use the hashtag We Are Cisco when they're talking about being proud to work at Cisco and so we started listening on that hashtag, and we're very good as a team at seeing, say, a photo someone posts on Instagram and immediately knowing whether that's just a photo and that's okay or that's an Instagram story because there's more to tell there. Or, that's an employee bylined blog post and again, they don't always realize they have stories and it sort of depends on their level of comfort with it to your point. Not all engineers, but most engineers are fairly introverted and much more about the data than they are about the storytelling. In that case, we'll just sit down with them. They'll do a brain dump for us about what they think and what their story is we just put the right pieces in the right order for them. We don't write it for them. We're very big on making sure it's the employee's voice. It might be edited, but it's certainly not written for them. We're not ghostwriting for 70000 employees because I would need a much bigger team and yeah, they get excited to know they have a story and then their team gets excited and their teams shares their stories. We've had some of our bloggers come back to us and say that their vice president asked them to present on their blog and what they learned from working with the We Are Cisco team and I'm like, "You guys. Wow." That gives us way more visibility than we ever thought we'd get, but 70000 stories, there's always something awesome to tell and they're amazing, amazing employees. Jay Baer: Do you find stories and tell them or do you have a pre-existing editorial cadence and then you're finding stories to fill those buckets? We know we're gonna have X blog posts a week and X IG post and X IG stories, so we have to find enough stories to fill those holes, or is it just when we have something worth telling, we tell it? Carmen Collins: It started the second way. It started when we have something to tell, we'll tell it, and I have never ... I've worked in social media for a long time, as you know, and before I worked in social media, we didn't even call it that and I'm not gonna tell you how old I am because that would just ruin my whole day, but most companies I worked for, we have the problem of not enough content. To your point, we have an editorial calendar to fill. We have 365 days of tweets to do. What are we gonna fill it with? We have the opposite problem because we're so good at finding these stories. We are filling a 365 day a year calendar, but we're scheduled out right now through December. Carmen Collins: Who has that problem? Carmen Collins: ... pops up, right? Carmen Collins: So that's our challenge is who can we move where, but we're really lucky in that we have this dearth of content that we are able to fill our channels every day. We do have what I call our fun days calendar because we know what people are gonna be talking about on social. If it's national chocolate chip cookie day and you're not talking about it in social, you're not paying attention, and so we'll have a calendar and we'll be like, "Hey, next week is national chocolate chip cookie day. Do we have any photos of employees?" We do, by the way. Employees at Cisco love food. We're very big on cookies and cookies and sushi and all kinds of food, so we have that planning structure in place, but the stories really come from what the employees care about. It's their moment because their moments are what's gonna attract new talent to come work with us because someone else is gonna see themselves represented or reflected in that moment. Adam Brown: Carmen Collins, it is great to have you back on the show. Three reasons I love having you on the show, number one, you've got this level of enthusiasm for what you do. Number two, what you do is so cool. Carmen Collins: I have the best job ever. Adam Brown: Third is you've been on the show before, so what I want to do is kind of compare and contract a little bit about how you approached certain topics three years ago when you were on Social Pros the first time and today. I know one of the things ... You just talked about having this unbelievable editorial calendar. You've got it filled through December. It's the opposite of what many of us and social media practitioners have to deal with. How important do you find it that is a brand social media presence both the general, just at Cisco and the storyline that you're being told there, and the content that you're sharing from a talent acquisition standpoint. How do you reconcile those two? Where and how do you determine what is going to be appropriate to go on Cisco and what's gonna go in terms of talent acquisition, and is that changing and has that changed over the past three years? Carmen Collins: That is a very company-specific thing. I don't know that talent branding is a new area of marketing, but it's certainly a new focus for a lot of companies and as such, I don't think a lot of companies have thought all the way through where does it fit. Some companies combine the general message of the company and the culture message. Currently, ours is separate and there's a strategy and a reason behind that because we are a big company and we have a lot of messages and we really wanted to focus on our play stories in our We Are Cisco channels, but how do we decide who talks about what? This is what's awesome about working at Cisco. I don't think at Cisco we ever rest on our laurels. I don't think we've ever said we've got it right. With culture, we have a very aspirational culture. Some companies call it an employee value proposition. We call it our people deal and it's basically this agreement that here's what Cisco expects of employees and here's what employees can expect from Cisco and we've realize that it's not that way everywhere in every team. It's an aspirational thing that we want to be. The same with our culture narrative. We are really paying attention as an entire company across all of our business lines, across HR and employee communications, and corporate social responsibilities. How are we gonna share a narrative and then each take that narrative and tell it in our own way in our own stories? We're learning at the same time. I wish I could answer that. I wish had a good answer for it's because of this. It's sort of an inherited way that we did it before. It sort of plays as to different team strengths right now, but we're really paying attention to how we go forward with it. Adam Brown: Have you had the ability to kind of track the arc for the recruits to Cisco? Let's say I'm thinking about joining your team. Maybe I follow the Cisco proper social media accounts and kind of get there, then I realize you're the talent acquisition and the work at Cisco type channels and I think when someone does that, they're really raising their hand and they're saying, "Listen, I'm pretty darn interested in this company" from a joining it type of standpoint. Curious how that kind of journey exists. Is that something that you're tracking? Is that something that you're measuring much like Jay and you talked a little bit about the ROI? Carmen Collins: I hope I'm gonna say this right because it's a little bit of a tongue twister and I can't lay claim to it and I unfortunately can't give the right credit to the right person, but some very smart person said once that there's no such thing as candidates and customers. Your customers can become your candidates and your candidates can become your customer, so there's really not a split between your company narrative and your culture narrative as much as we might present it that way. We're really not split that way and we do track the arc in different ways in different demographics. For example, Gen Y is much more concerned about a company that's gonna stand for something, that's going to have a voice in whatever thing that they're passionate about, sustainability, corporate responsibility, and so to that audience, they may come to us through our corporate social responsibly efforts. They may come to us through our ... We're one of the founding members of the equal pay alliance. I'm sure I'm not saying that right and my apologies to that wonderful crew for not saying their name right, but this is how Cisco is and what we stand for, so they might come to check us out through that avenue because that's what that generation cares about. Other millennials, and these are broad generalizations. Sorry to all the demographics for giving you broad generalizations because I'm certainly not your traditonal Gen Xer, either, so I feel your pain there, but millennials care a little bit more about their career growth. How are they gonna progress through? So, they might come through a mentorship program or an event, so we can see that arc. It's hard to have a metric to track that, but we have anecdotal things. For example, it's very Inception. We have a blog post on our Life at Cisco blog from an employee who said, "Here are the five blog posts that made her want to work at Cisco," so we know she came from our blog posts. I have no metric anywhere that tells me that. I just happen to know that she tweeted about it when she started at Cisco. She's like, "After reading about it for two years, here I am," and of course our team, being very good at what we do, reached out to her and said, "Hey, we think you have a story there." Jay Baer: That's great. One of the things that I find interesting is your use of video and that you have a new approach that you are pioneering on Facebook Live, IGTV, and tell us a little bit about how that works especially because your editorial calendar is full up until December and when you think about live video, that seems like the contrary of that, but perhaps not, so tell us more. Adam Brown: And people who are not employees, right, because they're interns? Carmen Collins: Well, interns, yes. That was an even harder thing to do this summer. They're employees for the 10 weeks that they're here, so this idea of employees taking over the account, we've had two years to get used to it. A lot of companies and brands would be scared of it. I can see why because it was terrifying, but we've never had an instant where we've had a problem because our employees are so concerned about doing it the right way and asking us what they thought about it after they're done and sharing metric with them. Adam Brown: And hold it the right way. Carmen Collins: Yes, yes, and it's a different way on Instagram than it is on Facebook and if you have overlapping ambassadors reminding them which platform they're on and interesting thing we found out that one of our ambassadors had an Android and I told her, "On Facebook, make sure you turn horizontally" and she turned her phone horizontally, but on Android, Facebook kept it vertical. I'm like, "I didn't even know that was a thing." Things you learn as a social media person every day. Jay Baer: I was gonna ask you about that, Carmen. On the Snapchat side with the interns, did you only allow interns to do Snapchat takeovers who actually know Snapchat or did you say, "Well, you're an intern. We'll teach you Snapchat"? Just curious. Jay Baer: What you're looking for. Carmen Collins: ... our goals are and what we're hoping they will do, so we make sure to tell them to have a swipe up at the end to go to the career site. We give them instructions on ... People hate horizontal snaps. Please don't do it. Use the lenses. Be Snapchat-y. We did train them on how we wanted it done, but we didn't train them on the Snapchat. Carmen Collins: They know more about Snapchat than I do. Jay Baer: They probably know. Yeah, they probably know. Carmen Collins: Yeah, they could teach me. Adam Brown: Speaking of Snapchat, I love the way that you're using and encouraging the use of different platforms to reach different audiences and we're gonna go back to our demographic clustering here even though it's so grossly offensive, but I love the idea. Snapchat is great for attracting those millennials. Twitter is kind of for those people in their main zone of their career path. LinkedIn, obviously ubiquitous for almost all of it. Curious if you're still, A, finding Snapchat good for interns and B, over the past three years, how is this adjusting and evolving in terms of which platform works best for what type of either talent acquisition or talent retention activities? Carmen Collins: It's a constantly changing environment. It's something we're always learning. Just a few weeks ago, Instagram threw Instagram TV at us, right? Carmen Collins: And now we have to consider longer form video on Instagram and we're so used to telling people, "10 seconds. 10 seconds on Instagram," so we are already evaluating our metrics, how are we doing? One of the things that we are really looking at and why we focused on interns this summer is because we noticed that when we started Snapchat, it was fantastic, one of our most engaging platforms. 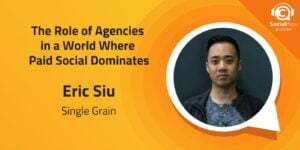 I think it surprised even us and we have seen the shift since Instagram stories launched and since Snapchat had their redesign and made everybody have the Snapchat apocalypse and how it's changed and how Snapchat as a platform has changed, and now they have a little bit of an algorithm-based ... I don't call it a newsfeed because it's not really a newsfeed, but it's not as organic as it used to be and we decided that this summer of intern program was gonna be our test. Is it going to give us the ROI we need if we focus specifically on that demographic, because interns leave in August and so what are we gonna do in August? Are we going to have the ability to keep this and that in the vain in which it's meant to be consumed? We're already everlasting and it's funny. I'm actually presenting at a conference. I think Jay has presented before, Digital Summit, and my conversation is Snapchat versus Insta stories. Who's gonna win? I have this series of graphics that I've received in my social media marketing emails. Maybe one them even came from Jay's email. I don't know. I'll have to go back and source my graphics, but the graphics between Snapchat versus Instagram get more and more violent over time. First, it's like, "Aww, sad Snapchat," and then the next thing you know, they're Mexican wrestlers in the ring and then they have a rap battle. The graphics get progressively more violent, but I saw for the first time last week a graphic that didn't even Snapchat in the equation. It was WhatsApp and the Instagram logo all sad face, so it's constantly evolving. We constantly have to look at where our audience is locally. Mexico City and South Africa love Instagram. Bangalore, not so much. They still like Facebook, so we have to even look as a global perspective and in China, we have WeChat and Weba learning how those work and for those audience, so we're always looking. We always as a team make it a priority to try something new, so my team has our virtual off site because, again, we're in ... How many locations did I say? Six locations? Adam Brown: Like five or six. Carmen Collins: Yeah, so we're gonna have a virtual off site because Cisco makes cool collaboration technology that we actually use and that's one of my challenges to the team is, all right, what new thing are we going to try to see if it sticks and it might be WhatsApp. It might be Reddit. I don't know. We're gonna figure out what it is and give it a try. Adam Brown: Carmen, I want to take that question and just slice it one level further. I loved how you said you were thinking about different social platforms for where people are and when you said where you meant geographically. I'm gonna take another slice of the where and that is where they are maybe in the consideration for a job. They haven't interviewed yet or they've submitted their resume or maybe they're on a second or third interview. They have an offer letter. Are you doing different things on different platforms with content that's really focused more on that person who has even come out to Silicon Valley? They've looked at houses. Their family's talking about, okay, are we gonna move from North Dakota to California versus that person you're just trying to get in, maybe that intern, to come out for a three month commit. Carmen Collins: Yes. It slices all ways. I will use our We Are Cisco Instagram as an example. LinkedIn has told us that the first thing someone does before they apply for a job and the last thing they do before they take a job is talk to an employee and there are all kinds of employee trust statistics, and you guys can go to Mr. Google and find those. You don't need me to bore you with statistics, but we try to approach people where they are at all points of the process because if you show up on day one and what we promised in social is not what you see when you walk through the door, we've failed, because one, you're not gonna stay very long and two, when you leave, you're going to tell people that we're lying and that's another reason we use employee-generated content because they're saying it. It's not us saying it, but we are trying to get people as close to a Cisco employee as you can get if you don't actually know one. There's 70000 of us folks. You should be able to find one of us someplace, but it's to get you in front of that raw here is really what it's like to work there, and that applies to all stages. Of course, we have paid strategies and targeted strategies for specific candidate profiles. Everybody in Silicon Valley right now is all about artificial intelligence and machine learning and so we will target that candidate pool to make sure that they know that you don't always have to work at some of our competitors to do that. Heck, we just invented a new network that thinks like the human brain and we have patent holders for that technology. We work on cool stuff, but it's approaching them wherever they are in that process, as well, through different methods. Some are paid. Some are organic and I think we do occasionally get some criticism because will look out our social posts or our blog posts at a moment in time. They're like, "Well, you're not saying what a day in the life in here is like," or, "You're not saying what an engineer is like or what it's like to be in sales," but we look at it as a scrapbook. You can't tell every story of every employee in one post. You have to look at it as a story over time, so our Instagram is a scrapbook of our employees if you took each post and did it old school. I actually enjoy scrap booking — interesting fact about me — but you would see that story over time, but it's hard to do all of that in just one post. Adam Brown: EGC, thank you. At Salesforce, we call it OHCA, [Ohana 00:31:52]. Adam Brown: How does this content resonate with obviously those folks, but the other employees who read it and are kind of reinforced, hey, this is a great place to work at. Hey, this is really is a special place in Cisco. Any way that you're measuring that and is that just kind of anecdotal or do you actually have concrete data that shows the impact? Carmen Collins: Yes, well, we have data, for example, for our blog. We are now able to see how many readers we have that are employees and how many readers that we have are talent and that's not as easy to do on places like Twitter and Instagram, but what we do is if an employee self-identifies in social media ... For example, we have a Twitter list of actual employees that we know work at Cisco combination they told us they do in their bio or in a tweet or something, so I can tell you by monkey math. I don't know what the term is by guessing that a certain percentage of our followers are also employees. It's a nice benefit. I don't think it's something we anticipated when we started three years ago that retention and employee excitement would be icing on the cake for what we were trying to do, but it's one of the best parts of my job is I have employee friends all over the world now that I've never met. Actually, my Cisco bestie, we met for the first time at Cisco Live a few months ago in Orlando and we're best friends at work. We're the ones that we always go to and so now we have a real life connection, but we have a lot of connections with these awesome employees around the globe and they get so excited to be featured. They get so excited for their teams and one of the people on my team came up to me last week and she says, "We have got to get our ambassadors some love," and I'll tell you why because it's a really good example of what the culture is like but also what we do as a team. Carmen Collins: As in origami cranes. Carmen Collins: And someone kept folding these beautiful origami cranes made out of either Cisco boxes or Cisco stationery and would decorate them and each one was numbered and they would leave them on desks and Cisco signs and it was anonymous. We never knew who this was and after a year of trying to convince this person to not be anonymous anymore, he agreed to tell his story. Luckily for us, he's a software engineer which is a key talent profile that we're trying to recruit for, so we were very excited when we found that out, but his sister had cancer and he promised her that he would try to make these cranes and put them all over the office and send her pictures to keep her spirits up. The tradition is if you make 1000 cranes, you get a wish, and his wish was if he made 1000 cranes, his sister would get better, and the sad part of the story is that his sister didn't, but the wonderful part of the story is that he kept doing it anyway and he's almost folded 1200 Cisco cranes now, but he leaves them on people's desk just to give them joy, just to give them encouragement, and when that blog posts went out, our blog team, the people who blog for us, lit up. Another blogger posted a picture of him with his sister who is also suffering from breast cancer, and it's just this community. Jay Baer: That's so great. Jay Baer: One thing on the attraction side I want to touch on before we get into your background briefly is you mentioned at the very beginning Glassdoor and that's something that wasn't nearly as prevalent the last you were on the show almost three years ago. Tell us about your perspective on Glassdoor, Indeed, and related sites. Do you feel like it is an important way for potential Cisco employees to think about do I want to be a part of this and where do you see that employer reviews world headed? Carmen Collins: Okay, I might have to come back for podcast number three. That's a big topic, but let me try to do an overview. Jay Baer: On the list for 2021, Carmen Collins. [crosstalk 00:37:26] Well done. Carmen Collins: For Glassdoor, I think it's just like any review site. I think you have to take the best reviews and the worst reviews and throw them out and take the middle reviews, and I think that's where the honesty comes in, but we have made a concerted effort as a team over the last couple of years to really grow our Glassdoor review numbers, and I think it's a little unfair and Glassdoor knows that I would say this, so I don't think I'm saying anything unfair to them, but Cisco as a company has 12000 reviews. A company like HP might have 4000 reviews. Jay Baer: Yeah, it's a lot. Carmen Collins: It's much easier to affect a star rating when you have less reviews. For us, it takes almost 2000 positive reviews to move a tenth of a point. For another company, it might take 50, so we get very excited by tenth of a point jumps and we just hit our 4.0 rating and it was like celebratory day and of course for this year, we never stop on our laurels. We're going for that, too, this year. Carmen Collins: But it takes a lot more reviews to do that, so we do put a lot of value in the review pieces, I think. Jay Baer: Do you approach existing employees and ask them to leave reviews, etc.? Carmen Collins: Yes. Now, we have to be very careful about how we ask. We can't ask for a positive review. Carmen Collins: Yes, in order for it to count, but of course we're gonna find employees when they're at their happiest. An anniversary, which we at Cisco call a Cisco-versary, or a promotion cycle or when our interns come in or when our interns leave for the summer or as employees who are participating in events like Cisco Live, of course we're gonna try to catch them when they're at their happiest, but we also respond to reviews and we respond to negative ones and positive ones. In a big company, you're gonna have teams and pockets of places that aren't perfect. Again, we've never said we were. We're very aspirational with our culture, but we put a lot of stock in that part. Jay Baer: Yeah, no data set's gonna be perfect, but over time, if you keep showing up on a bunch of lists in a bunch of different places, it's gotta mean something, but it's interesting to me that you're putting a lot of emphasis on it because some companies are, including some our clients and other companies including some of our clients, just don't feel like playing that game, so it's just interesting to hear your perspective. Carmen Collins: There is some gaming to it, but for us, we really focus on the reviews piece. That's to us the value. Again, that honest review of how do we get you as close to an employee when you're making that decision as we can get you? Jay Baer: You obviously love your job. You have said twice on this show that it's the best job in the world. How did this happen? How did you become the number one social cheerleader for a giant company like Cisco? Jay Baer: Other than I know you were a backup dancer for Usher. Carmen Collins: I was. I was a backup dancer. Adam Brown: That has something to do with it. Jay Baer: See, I knew you had a story. Carmen Collins: I was a backup dancer for Usher thanks to Cisco technology. Jay Baer: She's the best. She's unbelievable. Carmen Collins: We did an employee story on the Jimmy Kimmel wall of America is powered by Cisco tech and in doing that story, one of the employees had us reach out to the producers of the show just to get some background information and somehow I ended up on this list of when they make a request for Jimmy Kimmel's wall of America, they reach out to the audience of Jimmy Kimmel and find somebody to be on the wall. Usually, they were things like if you have a lizard tattoo, let us know and nothing was ever fitting for me until one day I got this email and said, "We're looking for backup dancers for Usher," and I know you all can't see me on the podcast, but I certainly do not look like a backup dancer for Usher, but I said, "Sure, I could do that," and we went through rehearsals and got to watch the taping of the show via Cisco technology and they said, "Go dance," and there I was on the big screen behind Usher. It was awesome, so see? It's still my job. I have the best job in the world. Carmen Collins: But you asked me a different question which was how did I get to the best job in the world? 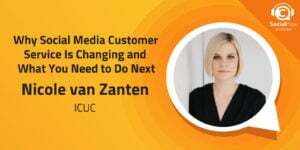 Jay Baer: Yes, how did that happen? Carmen Collins: I started life as a journalist. I'm a writer at heart. I'm a novelist. I still write all the time even though I don't often have time to do it anymore in my day job. I have a team for that now, but I still write, and when the internet became a marketing tool, it's kind of like sometimes when people give interns to social media accounts because you're like, oh, you're an intern. You understand this, which is not the right way to do things I just have to say. Adam Brown: Unless it's Snapchat takeovers and then it's fine. Carmen Collins: Unless there's some sort of training, but a lot of companies just give it over because they're like, "You're young. You can do it," but people said, "Well, you're interested in the internet, so you do this," and I got started doing that. I ended up at America Online which is really how I learned to write for the web and how to write to get people to click on something to make the want to see more and really hone my skills there and then worked for several Fortune 500 companies. I don't want to name them because the reason I love Cisco so much and the reason that I think that I've been on Jay's show twice now since working at Cisco is that I think when you're looking for a job, you have to look for a company that fits you as much as you fit a company, and it think when people are looking for jobs, they often are so concerned with "Am I gonna get this job?" then is it the right job? Adam Brown: They're thinking about that job. Carmen Collins: Yes. The title. Adam Brown: Not the two way street. Carmen Collins: Yes. Anytime you take a risk, but she called me on the phone because I have the best boss ever to check on how I was doing after surgery. I'm like, "I've got how we're gonna do Snapchat. We're gonna have employee takeovers," and to her credit, she didn't call me on my ... She's like, "Are you on something?" She said, "Go. Just do it," and that's what the company gives me and at Cisco, our whole team has been able ... We're an award-winning team now and people are like how do you do it? How do you get your [inaudible 00:44:46] to buy into this? First, the empower it. It really starts from the top and I'm finally allowed to be the social media person I always wanted to be. I always knew I could be, but a lot of companies, a lot of marketing teams put boundaries around something and don't let you think outside the box. As much as they encourage innovation, they really don't. Sitting in the HR department I think gives us some leeway to fly that we might not be able to do if we were being watched very closely in a marketing environment. Jay Baer: Yeah, and I think it does help. It does make a difference and I think the folks that we've talked to on the show who are coming at social from the talent side, from the recruiting side tend to really love that ability to do great social and not be part of the marketing apparatus and have a lead budget that they have to generate and things like that. It's just a different style of social and it seems very emotionally satisfying and that's a very small focus group of five or 10 people we've had on the show in a similar role, but Adam, do you agree? Adam Brown: I completely agree and I think it's part of this whole idea of embedding social media into the fabric of the company that we see so many of our guests, Jay, and other leading companies that are doing this that are finding ways of bringing the genuineness and authenticity that permeates through social media into, like in Carmen's example, HR. Jay Baer: Carmen, we're gonna ask you the two questions that we've everybody on this show including you, right? Jay Baer: We'll compare notes and see how your answers have changed. What one tip would you give somebody who's looking to become a social pro? Carmen Collins: Be social. When I started in this business, there wasn't a class you could take in college. You couldn't get a degree in social media. I learned what I know now and the same techniques I know now from watching what other people did and people ask me this a lot at Cisco. They're like, "How do you do this? I wanna take this back to my company," and I'm always like, "I'm happy to be open source and tell you the how, but I'm not gonna tell you the how," because I really want them to go back and make it their ... You're not Cisco. It's not gonna work this way for you. Just, we'd all like to be a Dunkin Donuts social media person because you get to market a donut. That's awesome, but I can watch them and admire them from afar and see what they do and make it mine, make it ours, so be social. Make relationships. I hired one of my best team members from a relationship on Twitter. We had never met in person. We met on Twitter and we both ended up at a social media conference and accidentally sat next to each other. Again, having never seen our faces, we didn't know we were our Twitter handles, and when we had the time to introduce ourselves, we turned around and like, "Oh, you are that person?" and she's still on my team now because you make that connection, so be social. Jay Baer: Yeah, how many episodes did we do of this show before we met in person, Adam? Jay Baer: Like 60? Something like that. Adam Brown: At least, yeah. Jay Baer: It was over a year doing this show because we actually met which is crazy. Carmen Collins: Well, I only did the show once before and Jay and I showed up. His suit matched my purple hair. We'd only met once and we were coordinated after that. Jay Baer: Still one of my favorites. Carmen Collins: We're in sync. Jay Baer: That's true. That's true. Last questions for Carmen Collins as the senior social media and talent brand manager at Cisco, and it's just a delight. If you could do a video call with any living person, who would it be? Carmen Collins: This was a hard choice when I knew you were gonna ask me this question again, but I think I will match my original answer. 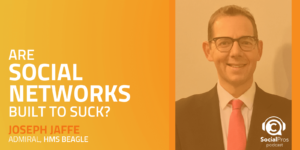 Jay Baer: Oh, sticking with your answer? Okay. Carmen Collins: No, no, no, it's an offshoot to my answer. When I answered several years ago, it had to do with The Walking Dead. I'm a huge Walking Dead fan. Jay Baer: Yes. It was Rob Kirkman was your answer. Carmen Collins: Yes. I think in this particular instance it would be Andrew Lincoln who plays [crosstalk 00:48:40] character. Jay Baer: Rick Grimes on The Walking Dead who apparently is leaving the show. Carmen Collins: That's why I want to talk to him. I'm like, "Okay, [crosstalk 00:48:48]" because the last couple seasons [crosstalk 00:48:51]. Adam Brown: That train's left the station. Jay Baer: Yeah, that's too late. Carmen Collins: I love Norman Reedus and Daryl and he's awesome. Everything he does ... He's so kind to his fans and I've got a whole bunch of autographs, but Andrew Lincoln is the one I haven't gotten to meet and now he's leaving me. Carmen Collins: They're fun to go. Jay Baer: Yeah. They need a speaker, right? Book me. Carmen, congratulations on all the continued success. We love, love, love what you're doing at Cisco. Really, really happy for you and your whole team and they are lucky to have an advocate such as you. Carmen Collins: Well, I'm lucky to have an amazing team and an amazing boss and an amazing company, and thanks. I'm exciting to be a repeat guest. Jay Baer: Ah, we're glad to have you. Adam Brown: We are, too. Jay Baer: Social Pros listeners, hey, if you're looking for a job, Cisco may be right for you. Carmen would be happy to associate [crosstalk 00:50:04]. That's right. That's right. Exactly. We'll see you somewhere, hopefully. Carmen, I appreciate you very much. Ladies and gentleman, all of the transcripts of this episode, every other episode going back nine years on this show or whatever it is now, you can find it at socialpros.com. The same way that Carmen appreciates her community and her team, we do, as well. Adam and I love each and every one of you. Even though there's a lot of podcasts out there, we really appreciate you choosing this one. This is the show for real people doing real work in social media. This is Social Pros.